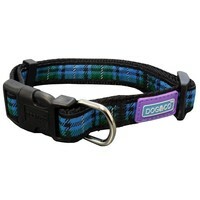 Dog & Co Tartan Adjustable Dog Collar (Blue) is a high quality collar with an eye catching design. Made out of durable nylon materials, the collar is fully adjustable with a snap clip buckle to make it easier to put it on or take it off your dog. The Dog & Co Tartan Collar also features a sturdy D-ring which almost any lead can be attached too.